I almost got into a fight at Anglesey Abbey near Cambridge today. I'm actually quite proud that I got this far - Anglesey was my 91st scone mission, which means that 90 trips have passed off without incident. Why is this impressive? Well, you only need to read a few TripAdvisor reviews to realise that a National Trust property is chock-full of potential hazards for the easily offended. There are car-parks where someone might take the spot you saw first. There are queues where someone might get served before you. There are people who might look at you funny. You would be amazed at the amount of people on TripAdvisor who give an NT property 0 out of 5 because the woman at reception "was very abrupt SO WE LEFT IMMEDIATELY!!" Anyway. There was no punch-up; the police were not called; you will not be required to launch a campaign to free the National Trust Scone Blogger. Part of the problem today was the amount of people - Anglesey Abbey is the National Trust's 10th most popular property and it was very busy. But it's well organised and there's plenty to do. The house is presented as Lord Fairhaven left it; very much a country estate from the first half of the 20th century. Only the Dining Room remains from the priory days - it was originally built in 1236. It's a sizeable house and it's full of art and ornaments. There's even a gallery with Lord Fairhaven's extensive collection of pictures of Windsor Castle. The highlight for me today though was the working mill. I absolutely LOVE a National Trust mill. They are ALWAYS manned by the most enthusiastic, knowledgeable volunteers ever, which explains why we came away laden down with bags of flour "milled just an hour ago!" 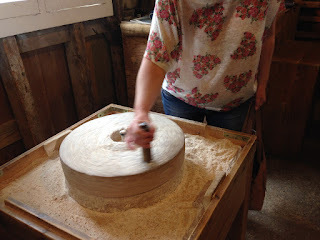 I was especially glad to see a mill today because my mother and sister were with me. When I started this project, almost exactly two years ago, I tried to explain the National Trust Scone Blog concept to my sister. She gave me the same pained expression that I have seen many times over the years, the one that says 'please, please let one of us be adopted'. Anyway, back in 2013 I persuaded her to come on an early scone mission to Houghton Mill and she LOVED it, particularly the rotary quern. So she was over the moon to find one at Lode Mill today. That's Christmas sorted. But onto the scones. 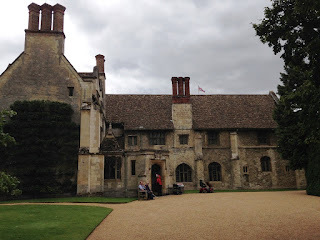 Anglesey Abbey is extremely popular with the National Trust Sconepals that I have befriended since I started this blog. Almost every weekend I get sent a photo of someone enjoying an Anglesey scone, although the verdict is not always 100% positive. 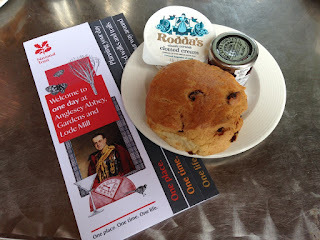 So I was very pleasantly surprised today to be faced with an excellent scone. It was very fresh, it was the perfect size, and it tasted delicious. I'm not sure whether they use flour from the mill - I really hope so - but it was great. Almost worth a scrap. I require more details about the almost-fight, please. Well, Xenia, it was the age-old issue: are people queuing for hot drinks allowed to jump the bit of the queue that is deliberating over hot food? To cut a long story short, I followed the rules and did what the staff told me to do but an old man took offence and was rude when there really wasn't any need to be rude at all. Ah the queue. I think that's where most fights start in this country. You've made my day. I'm the baker at Anglesey Abbey, working with my fantastic volunteers to make countless scones every week. I'll let my ladies know that you enjoyed the fruits of our labour and that we scored top marks. Thank you! Thank you, Susan! We're loving your work!